In May 1947, LIFE magazine devoted a full page to a picture taken by a photography student named Robert Wiles. The photograph is extraordinary in several ways—not least because it remains, seven decades later, one of the most famous portraits of suicide ever made. Along with Malcolm Browne’s 1963 image of a self-immolating Buddhist monk and a small handful of other photos of men and women seen before, during, or after their own self-slaughter, Wiles’ picture graphically and unforgettably captures the destruction—both literal and figurative—that attends virtually all suicides. 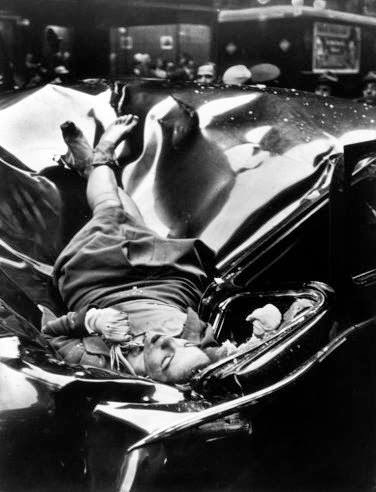 The woman in the photo was 23-year-old Evelyn McHale. Not much is known of her life, or of her final hours, although countless people have put enormous effort into uncovering as much about the troubled, attractive California native as they possibly could. For example, the tremendous visual-culture blog Codex 99 has a solid discussion of her life and her suicide. But even that examination of her history and her death feels somehow lacking—not because the Codex post is weak, but because Evelyn left behind so little to hold on to. In the end, there is not even a graveside; she was cremated, according to her wishes, and no marker or tombstone exists. But beyond the mystery of Evelyn McHale’s life and death, there is the equally profound mystery of how a single photograph of a dead woman can feel so technically rich, visually compelling and—it must be said—so downright beautiful so many years after it was made. There’s a reason, after all, why she is often referred to as “the most beautiful suicide”; why Andy Warhol appropriated Wiles’ picture for his Suicide: Fallen Body (1962); why once we look, it’s so hard to look away. In Wiles’ photo, Evelyn (it doesn’t feel right to refer to her as “Ms. McHale”) looks for all the world as if she’s resting, or napping, rather than lying dead amid shattered glass and twisted steel. Everything about her pose—her gloved hand clutching her necklace; her gently crossed ankles; her right hand with its gracefully curved fingers—suggests that she is momentarily quiet, perhaps thinking of her plans for later in the day, or daydreaming of her beau.